Today, we present the explanations to questions #3-4 from our Tricky Data Sufficiency Questions challenge post. You can find the explanations to questions #1-2 here. Let’s get started. Add 3z and subtract 2x from each side of the equation to isolate the z term. Factor the two from the right-hand side of the equation. Turn to Statement (1) and try to isolate y – x.
Subtract y from each side of the equation. Statement (1) is sufficient. Eliminate B, C, and E.
Turn to Statement (2) and try to isolate y – x.
Subtract x from and add 2 to each side of the equation. Statement (2) is sufficient. Eliminate A. The correct answer is D.
This problem yields a system of linear equations. Let the number of labs on which René earned a score of 100 points=x. The total score for these labs=100x. Let the number of labs on which René earned a score of 85 points=y. The total score for these labs=85y. The total score for all labs=100x+85y. The question asks us to solve for x. Statement (1) can be rewritten as 100x+85y=1140. Statement (2) can be rewritten as x+y=12. Since only one integer value for y yields an integer value for x, and since both x and y must be integers, Statement (1) is sufficient. Eliminate B, C, and E.
Statement (2): Any pair of integers that sum to 12 is a possible pair of values for x and y, so Statement (2) is not sufficient. Eliminate D. The correct answer is A. Remember to check back on Wednesday for the explanations to questions #5 and #6. In the meantime, you can check your answers here. How can we possibly solve number 4 in the short time we have to solve each question? I mean to get the idea that we should test numbers because only one of them might result in a multiple of 100, and then actually complete this table, all in under 2 min? I’m glad you asked this. 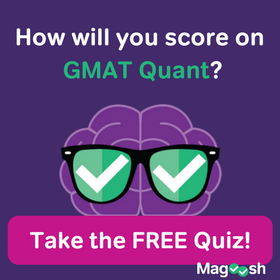 You’ve raised a very good point about average solve times for questions on the GMAT. You probably can’t solve this question in under 2 minutes. But remember, 2 minutes or so is your average solve time. 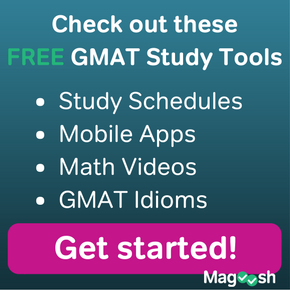 Some trickier questions will take longer than average, and some easier questions will take less time than average. 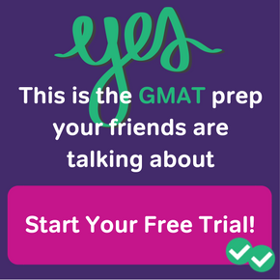 The trick is to make sure it all evens out to a reasonable amount of time per question overall. Does this make sense? Hi, I want to find out. Why were the 2 linear equations not solved together? If that was the case, we would have still gotten x=8 and y=4 and the answer to the question would be C instead of A.
You’re correct that combining the 2 linear equations will also get the vlaues needed to solve the problem. However, this doesn’t mean that the answer is (C). Remember, (C) says that NEITHER statement is sufficient on its own and that the statements only get the answer when you combine them together. But this isn’t the case here, because statement 1 is sufficient on its own. You can combine Statement 1 with Statement 2 to get the answer, but you don’t HAVE to. It’s possible to solve the equation with only Statement 1. Hi, I believe you made a typo on the explanation for Question #4, in the table, item 3 should be no (for the column mulitple of 100). Thank you for your feedback! You are absolutely correct. We will have someone on our Content Team fix the typo. Thanks again! I believe that you made a mistake in your explanation for #4. You used 80y when that term should have been 85y. Consequently, the new eqaution formed should have been 100x + 85y = 1140. Additionally, I have no idea how you came up with the number 940 in your equation.